Barry the Bee (voiced by funnyman Jerry Seinfeld) isn't your typical, garden variety bee, as he wants to get out of the hive... hold on, actually I guess many normal bees like to get out of the hive... okay, well he's different in that he can speak English... wait, I forgot, every bee in this movie knows how to speak English, they just don't do it because it's against the law. Sorry folks, I guess I don't know what actually makes Barry different than other bees, except for maybe that he is the first one in however many millions of years that bees have existed who actually breaks the bee law and speaks to a human. Surely, this heinous crime cannot go unpunished! It is a sacred law after all! Well, you'd think, but no, a few bees seem to be mildly upset about it, but that's about as far as it goes. And in fact, when Barry decides to sue the entire human race, many of the bees actually join him in court. Ah, but I'm getting ahead of myself. Let me start at the beginning. Barry is a bee who has just finished a hard 3 days of high school followed by another hard 3 days at college, and now it's time for him to pick the job that he will have for the rest of his bee life. Problem is, unlike all the other bees, Barry doesn't want to get stuck with only one job for the rest of his life (oh, I guess that's what makes him different!). So he decides to go out with the bees that leave the hive to collect pollen, so he can experience life outside the hive, and while doing so he inadvertently gets separated from the squad. After a short series of events, he ends up inside the apartment of a florist named Vanessa (voiced by Renée Zellweger), where she saves him from being smashed by her boyfriend. After he leaves and she is alone, he decides to break that oh-so-sacred bee law and verbally express his gratitude to her for saving his life. A relationship quickly blossoms, and we are soon yanked into a new direction for the movie when Barry sees jars of honey stocked on a store shelf, concludes the honey is stolen, and decides to sue the human race. Well if you weren't in a happy-go-lucky mood before, I'm sure you're enjoying yourself now! So Barry sues, wins, and now that all the honey is returned to the bees, they have no need to work anymore. This prevents any kind of pollination from occurring, which in turn causes every plant on earth to die. Ha-ha-ha-ha! Funny stuff. And not only is this a fun little light-hearted animated feature, but it's so scientifically accurate as well. I'm certain that every plant on the face of the earth would shrivel in die within one season of bees ceasing to help cross pollinate. Anywho, all the bees are now bored, Vanessa's florist shop is out of business, and everyone blames loveable little Barry. Ha-ha-ha-ha! Oh, and remember that commercial for the movie where Barry is on the windshield of a car speaking with a mosquito voiced by Chris Rock? Well, aside from a short scene at the very end of the film, that's the only spot where the mosquito shows up. So Chris Rock is no more than a cameo here. Oh, and want me to tell you about all the other friends and acquaintances Barry meets? Sorry, I can't, because he doesn't really meet anyone. There's his parents and best friend which we meet at the beginning of the movie, the bees that take him out of the hive, and then Vanessa and her boyfriend. That's pretty much it. I guess what I'm saying here is that his movie is bland, the story seems to lack focus, it doesn't lift your spirits, it doesn't take you on an amazing adventure, and it doesn't get you to rally around a central cast of characters hoping they will overcome whatever obstacle crosses their paths. The DVD release contains two discs, which really doesn't seem necessary. On the first disc is the commentary, which I haven't listed to yet and probably never will. Also, there are these short live-action things called "TV juniors" which is Jerry Seindfeld acting out some scene dealing with the production of the movie. They are meant to be funny, but most aren't. And the menus make it seem like there are only about 8 of them, when really there seem to be more like 50 of them. You'll definitely want to pass on watching those. And if you don't believe me, then just watch a couple and you'll get the idea. Trust me, they don't get any funnier. The second disc contains a lame music video titled "We Got the Bee", and a few other things you'll probably pass on. One of these is an interview with Barry the Bee, except instead of a straight interview, you have to ask the questions by selecting them with your remote. There are ten questions, and after each response from Barry you have to manually select the next question. I don't know why they couldn't have just played them all in a row. Guess they just thought that we had been annoyed enough yet. Oh, and Barry responses are not only short, but about half of each one is simply footage from the film which we just watched. Bee Movie , released by Paramount Home Video, is available starting March 11, 2008. Honey is very funny in DreamWorks Animation SKG, Inc.’s (NYSE: DWA) sweetest new animated smash hit, Bee Movie, which makes its buzz-worthy debut on DVD on Tuesday, March 11th. 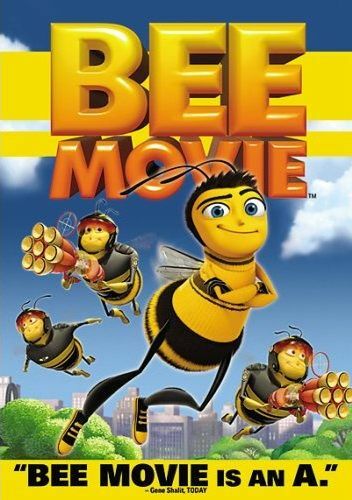 “A delight for both kids and parents” (Jeffrey Lyons, NBC’s “Reel Talk”), Bee Movie, written, produced and starring world-renowned comedian Jerry Seinfeld, took audiences by swarm, earning over $274 million in worldwide box office and garnering Golden Globe®, Annie and Critics Choice Award nominations for Best Animated Feature Film. The film boasts an all-star cast of voice talent and a delightful story that is “clever and fun” (Leonard Maltin, “Entertainment Tonight”) and entertaining for viewers of all ages. Following the adventures of a honey bee named Barry B. Benson, Bee Movie is an uproarious look at Barry’s rollicking adventure outside the hive as he proves that even a little bee can spell big changes in the world. The Bee Movie DVD presentation includes a hive-full of bonus material that will keep viewers as busy as...well, you know...with hours of beehind-the-scenes features and fun-filled activities. The two-disc special edition DVD offers fans even more – with alternate endings, lost scenes, commentary by Jerry Seinfeld and the filmmakers, the “TV Juniors” segments that aired on NBeeC, Jerry Seinfeld’s in-costume flight over the Cannes Film Festival, an inside look at the cast, a music video, a DreamWorks Animation Video Jukebox, a look at the technology behind the film, the early live-action trailers and much, much more. The DVD will also be available as a single disc. TV Juniors—Hilarious “behind the scenes” segments with Jerry Seinfeld that aired on NBeeC. Live Action Trailers—Early trailers for Bee Movie that only Jerry Seinfeld and his friends—including Chris Rock and Steven Spielberg—could have come up with. Alternate Endings—Find out how the film could have ended with special commentary. Jerry’s Flight Over Cannes—Jerry’s famous entrance to the world-renowned festival created international buzz. Inside The Hive: The Cast of Bee Movie—A close-up look at the all-star cast of voice talent. Everyone is buzzing about Bee Movie. In this hit comedy from creator Jerry Seinfeld, ambitious young worker bee Barry B. Benson soars out into the world in search of nectar and adventure. With the help of his new friends, Mouseblood the Mosquito, a florist named Vanessa and the high-flying pollen jocks, Barry sets off an un-bee-lievable chain of events that prove even a little bee can make a big difference!